Successfully Added HSDPA Wireless USB Modem for Laptops + Netbooks + Computers to your Shopping Cart. HSDPA Wireless USB Modem for Laptops for surfing high-speed wireless internet on your laptop computer. Imagine being able to access wireless internet on your computer not just in your local cafe, but anywhere you go: in the park, on the bus, and any room of any house. How is it possible? This 3.5G enabled HSPDA USB modem (also compatible with 3G and lower) offers high-speed wireless connectivity for Windows laptops and netbooks on HSPA networks. With download speeds of up to 7.2Mbps, you can enjoy browsing the internet, emailing your friends, and chatting online, all at speeds comparable to public Wi-Fi hotspots. No matter where you are in the world, you can connect to the internet on high-speed tri-band UMTS networks or drop back to quad-band GSM/EDGE networks. This wireless modem also allows you to send and receive SMS messages and manage your SIM card's phonebook on your computer. In addition, there is a micro SD card slot for the convenience of storing your media and work files, or can simply be used to transfer files from one computer to another. Setting up and using this HSDPA wireless modem is quick and easy. 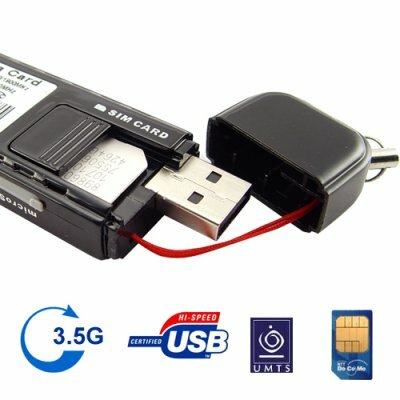 Just slip your SIM card into the modem and connect the modem to a free USB port on your computer. Your computer will detect the modem and begin installing the software from the USB stick automatically. The software has preset configurations for networks all over the world and will locate available networks in your area automatically. You can also manually configure your network and connection settings. The user friendly interface makes configuring your network and managing your SMS messages and phone book quick and easy. With amazing functionality and everyday practicality for a wide range of users, this wireless modem is sure to sell quickly. So get yours today and start surfing the net tomorrow. Or buy in bulk to give everyone in you office high-speed wireless internet. From your best source of high quality wholesale electronics, Chinavasion. Where can I find a list of HSDPA networks in my area? Can I use this wireless modem with my 2G or 2.5G card? Can I use it with Edge? Yes. This modem supports 2G, 2.5G, 3G, and 3.5G cards. Do I need any extra software to use this HSDPA wireless modem? No. The only software you will need is inside the USB key. How does this device work? Do I need to have some arrangement with the telephone company? The device requires a SIM card. You can connect to the internet on high-speed tri-band UMTS networks if your local area supports this. If your area has no UMTS, then you can still connect to the slower quad-band GSM/EDGE networks which are available everywhere. You must make sure that your SIM card is not locked (password protected) as this may cause problems.